The thought of wearing jewellery to the beach has never entered my mind until my recent trip abroad. Not by virtue of the old wisdom that maintains "never wear jewellery to the beach" or otherwise funky tan lines, but for someone who prefers the invisible-looking jewellery ideology, I have yet to find something that goes with my personal mantra of "less is more". To wear jewellery to the beach I want it to define my low-key sense of style. Despite my reservations, the trend of accessorising stylishly to the beach has never been so popular in a society where innovative and trend-setting style is the desired aim for inner fashionistas consciousness. You could layer and pile everything on to create a statement multi-layering effect, or something more simplistic, contemporary and subtle. This is where Elisha Marie Jewellery dreamily waltzes into my life. Using sustainable materials and recycled precious metals, she has perfected that multi-dimensional versatility within her stunning minimalist collection. Her specialism in linear shapes and organic textures compliments that casual beach look, and for me it most certainly a definition of 'less is more'. Moving on from the beach, there is no hesitation in wearing her designs on a day to day basis, on those special occasions and adding something a little extra in the working environment. I absolutely adore the stackable trio point gold rings of varying heights and the triangular braided rope cuff, two of my favourite pieces in her collection and both are wonderfully compatible. I wore them together and left everything else to rest. By concentrating on one specific area I felt I've created a perfect balance of minimalist and casual wear. 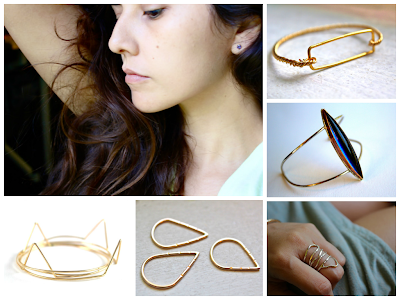 Elisha Marie jewellery fulfils my obsession with dainty and delicate geometric jewellery. Gold jewellery is perfect for the beach and compliments the tan perfectly. With gold not being my first colour of choice initially, it is fast seeping into my consciousness as an answer for my ever interchangeable style. The daughter of a skilled craftsman, and a Mother who loves photography and traveling, Elisha grew up with a strong sense of artistry. In 2011 after enrolling into a Jewelry design program and becoming captivated by the art, Elisha Marie Jewelry was born. Elisha Marie Jewellery is the second part of my new exciting collaborative project based on etsy boutique owners concentrating solely on independent jewellery designers every fortnight. The designers I've have chosen are all unique in their own way and everything is completely made by hand.